Diabetes is caused by deficiency of insulin, which is an important hormone made by beta cells in the pancreas. The signs of diabetes in cats are typically weight loss despite a good appetite, and excessive thirst and urination. Treatment of diabetes in cats usually requires daily administration of insulin injections and appropriate nutrition, and must be specifically tailored for each individual. The goal is to control the signs of diabetes (weight loss despite a good appetite; excessive thirst and urination) and to avoid low blood sugar (hypoglycaemia) due to insulin over-dose. The best outcome tends to be achieved when the owner of the diabetic pet and their veterinarian work together as a team. Diabetic remission is a period of time when a diabetic animal does not require insulin injections to control the signs of diabetes. This is most common in diabetic cats, especially in the first few months after diabetes is first recognised. 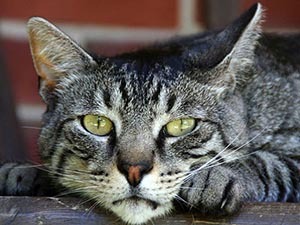 What commitment is required at home when treating a diabetic cat? Insulin injections are typically administered by the owner to a diabetic pet every 12 hours. It is very important that injections are given at the exact time that they are due. If it is ever not possible to give an insulin injection on time, then it is better to miss that particular injection than to give it at another time. Appropriate nutritional strategies can complement insulin therapy in diabetic cats and so it is often beneficial to make changes to the diet or feeding regimen. Information collected at home about a diabetic cat’s progress helps to monitor the success of treatment and can provide clues about the risk of hypoglycaemia. The most useful information comes from routine recording of general demeanour, daily water intake, changes in body weight, and the presence or absence of glucose in the urine. Appetite, general demeanour and behaviour. This should be recorded every day. Meal amount and composition should also be recorded every day. Insulin dose. This should be recorded twice each day. Water intake. This should ideally be measured every day when your cat is receiving insulin and every week when your cat does not require insulin. The key is to determine how many millilitres of water your cat drinks over a known number of hours. 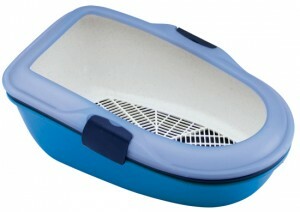 For example, a measured volume of water can be provided in a bowl and access to other water sources prevented. The volume of water remaining in the bowl can then be measured after 24 hours. Urine glucose and ketones. This ideally requires collection of a sample of urine from your cat every day. This can be either a liquid sample or some wet kitty litter or soil that has been moistened using tap water. The urine must be tested with test strips called Ketodiastix and a record kept of the results. Body weight. Ideally, a diabetic cat’s body weight should be recorded once each week. It is important to use the same scales each time the cat is weighed. Scales designed for weighing adult humans are not suitable for cats. Scales designed for babies are a suitable option. Link to an Excel spreadsheet that can be used for recording information about your diabetic cat. The first row has been filled in as an example. “The hardest thing for me was getting Ed’s urine sample – until I found an amazing product at the local Pet Store. It is a Cat Litter Bin – with a difference. It is made in Italy & called: “Furba Toilette per gatti”. You can find it at the link below. This product is so good that I’m sure you would have told me about it if you had been aware of it, so I’m letting you know so that other cat-owners can benefit as well. This litter bin consists of 3 plastic bases shaped like baby-baths that stack – one on top of the other. It also has a rim around the top that clips on & holds the base-sections in place. The top layer has a grill in it. The other two are simply catchments – like a bucket. And these two are exactly the same. The product has been designed in such a way that – as the litter clumps, the clumps stay up the top and the urine is caught in the catchment below. So you lift the top grill and the used catchment away from the unused catchment (which is stacked underneath). From there, you sieve the good litter into your new catchment, tip out the clumps & faeces and pop your clean grill back on top. You then clean out your used catchment & stack it underneath the other two where it serves no current purpose – just sits there ready to be exchanged next time. Clipping the rim back on keeps the apparatus together. I have made one modification. The holes in the top grill section are quite large. Perhaps they would suit litter with large particles – but the regular variety would eventually work through. So I bought a rubber mesh non-slip mat (fly wire or some other mesh would do just as well) and I cut this a little bit larger than the grill pattern and placed it there before tipping the cat litter inside. Now, when I lift up the top grill section I have the ideal situation to test the urine. Since Ed has had diabetes, he has an enormous amount of urine and it smells really bad. In this area my modification has 2 unexpected added advantages. Because the urine drops straight through the cat litter & sits underneath it – the urine smell is far, far less than it was. That’s by far the best advantage. By using the mesh underneath – Ed can’t scrape the litter away from the base when it gets too thin – because his claws get stuck in it. So now he is careful to only scrape where the litter is thick & this keeps the litter more even across the tray. Insulin dosing pens are designed for use by people with no medical training. They are easy to use, more accurate and precise for dose measurement, and are less painful for the patient. As diabetic cats typically require small doses of insulin, for example 4 Units or less of insulin every 12 hours, even small dosing errors can result in large day-to-day dfferences in dose. Insulin dosing pens are much more accurate and precise than insulin syringes for small doses. For example, when administering a dose of 1 Unit of Lantus insulin, the average dose delivered using the SoloStar pen is 1.02 Units (range: 0.60-1.40 Units). In comparison, a study evaluating the accuracy and precision of insulin dosing by paediatric nurses using 0.3 mL or 0.5 mL insulin syringes found that the average dose delivered when intending to administer 1 Unit was 1.64 Units (range: 0.65-2.80 Units). Importantly, it can be seen that most syringe-measured doses exceed the intended dose. The SoloStar insulin dosing pen is pre-filled with Lantus insulin and administers doses in 1 Unit increments. The technique for administering insulin using a dosing pen is quite different to that for syringes and needles and so an introductory training session is required before using a pen at home. For this and further general information for diabetic cats, download this PDF. 2 How is diabetes treated in cats? 3 What is diabetic remission? 4 What commitment is required at home when treating a diabetic cat?